We had just got to the end of a meeting in the office when the room started juddering. It felt as though a large truck was driving down the road outside. Then it got worse. My friend looked up at me with wonderment in his eyes and said “It’s an earthquake”. I didn’t know what to say. Nobody has ever trained me in how to respond to a major seismic energy transfer happening under my feet – a worrying omission in my upbringing, I know – and for the first few seconds we just sat there jolting back and forth, wondering what to do. Then it got worse. The room was really moving around quite a bit. My friend looked at me again and said, “Do you think we ought to go outside?”. This struck me as a good idea. If a building is going to collapse it seems prudent not to be inside it at the time, and we duly walked outside and into the sunshine. There, a small crowd of people stood around looking concerned. Many of them were calling their friends and family to find out if they were ok. The trees around us were being jolted back and forth, while the tall metal lamp-posts on the newly-constructed Metro Bus route were swaying back and forth to an alarming degree. It is profoundly odd to feel the ground move beneath your feet. We take it for granted that the ground stays still – not an unreasonable assumption; it generally does exactly that – so to feel it shuddering back and forth, bucking up and down to a noticeable degree, was weird. This, after all, is the foundation for buildings, for roads, for us when we walk and drive, for everything we do, and to have it moving was disturbing. The shaking eventually stopped. I tried to call my wife but the mobile networks were down. Eventually we got in touch via WhatsApp and she told me that she was fine, and was standing in the street with the kids wondering what to do. I jumped on the bus and went back home to be with them. On the way every person on the bus was talking about the 2005 Kashmir earthquake which killed over 70,000 people. Everyone in northern Pakistan has a memory of this awful event: a relative killed, a house destroyed, an entire village slipping into the river. 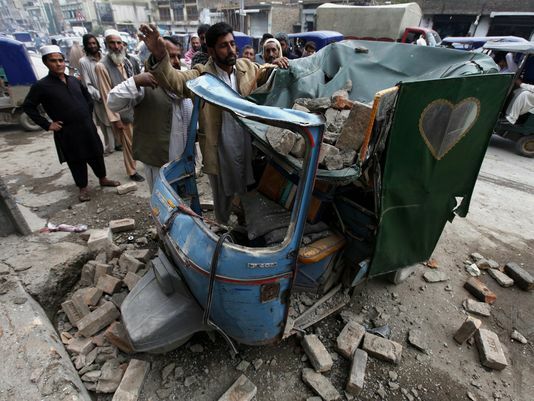 We later found out that this earthquake was of the same magnitude as the 2005 event but happened much deeper underground – a fact which saved most of northern Pakistan from unimaginable destruction. That night we went to bed grateful for our safety. Then, at 4am, our son came into our bedroom, wide-eyed and anxious. “Daddy, is the earthquake going to come back again?”.